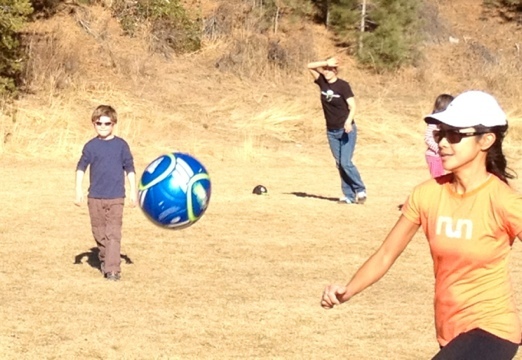 Parents versus Kids soccer match on New Year’s Day, Truckee, California. It was sick fun! Kids won (ouch). They ranged in age from 6 to 13. Grownups were all 40-something. At least the injuries were minimal. One kid hurt her finger, and one mom hurt her ankle, um, squatting behind the bushes to pee. Mind you, she is a runner/ skier/ triathlete extraordinaire. Yes, aging is painful. My soreness level the day after is not bad, given this old body normally only goes forward, not side to side. Hip flexors and glutes are pretty angry. I’m calling it cross training. This entry was posted in cross training by On these feet. Bookmark the permalink.